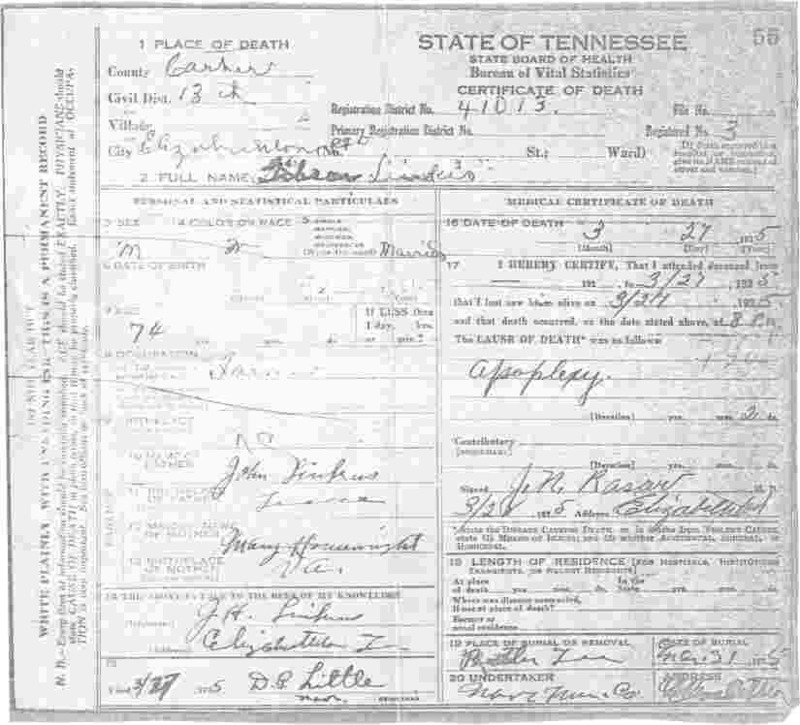 J.B. Linkous Jr.(48 kb) A death record for J.B. Linkous Jr. in 1915. Could this be the missing John B. Lincus of the "Linkes" branch? Or his child? Gibson Lincus/Linkes (28 kb) Death record of #771. Gibson Lincus/Linkes son of #77. John B. Lincus & Mary Ann Housewright. 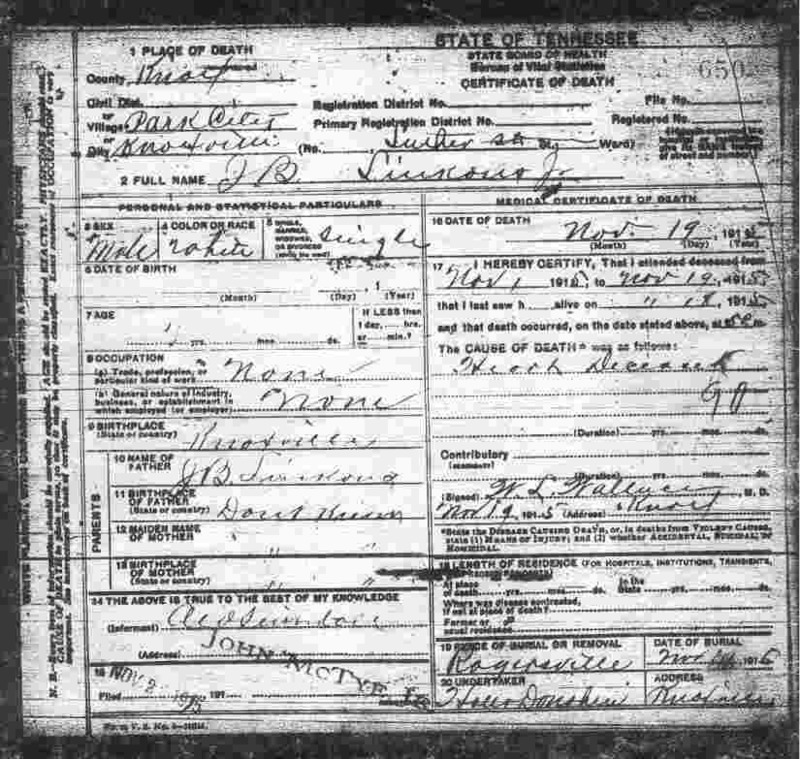 Julie Ann (Hicks) Lincus/Linkes (42 kb) Death record of Julia Ann Hicks-Lincus/Linkes, wife of #771. Gibson Lincus/Linkes. Center Coplin Lincus/Linkes (55 kb) Death record of #7711. Center Coplin Lincus/Linkes son of #771. Gibson Lincus/Linkes & Julie Ann Hicks. 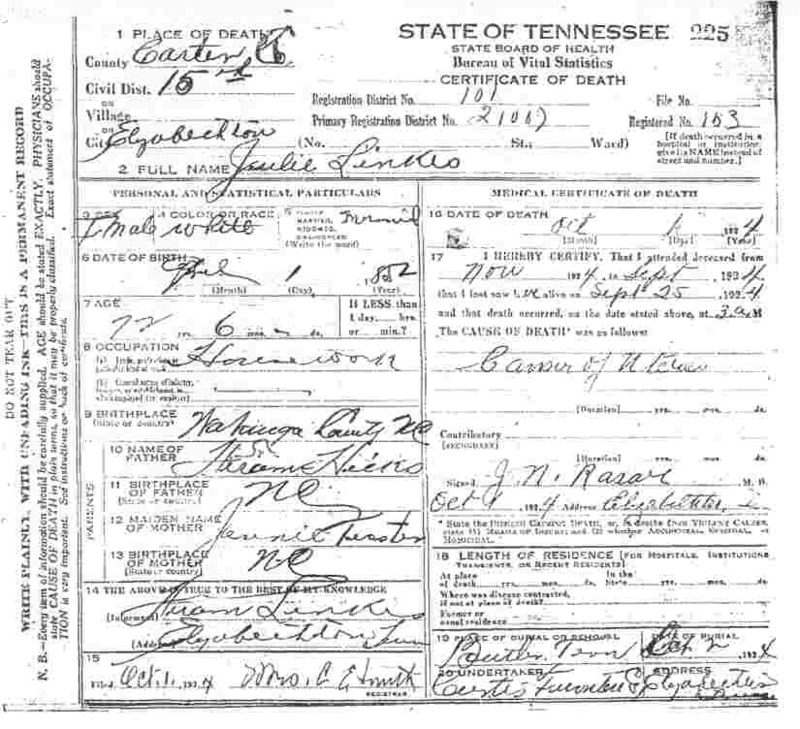 John Hiram Linkous (333 kb) Death record of #7712. John Hiram Lincus/Linkes son of #771. Gibson Lincus/Linkes & Julie Ann Hicks. Susan M. Connor-Linkous (594 kb) Death record of Susan M. Connor-Linkous (?Lawson?) wife of #731.John W. Linkous Sr.
Mary Gross-Linkous (351 kb) Death record of Mary Gross-Linkous wife of #74.Barnabas B. Linkous. 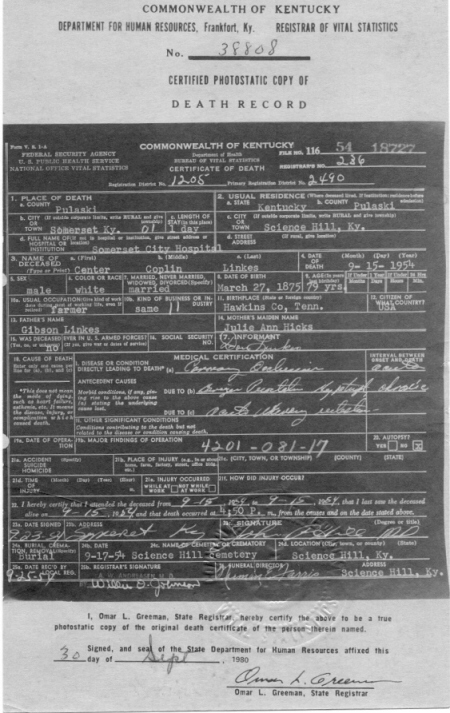 John W. Linkous (412 kb) Death record of #731. John Washington Linkous Sr. son of #73. Davidson Bennett Linkous & Mary ____?______ . Wiley Linkous (86 kb) Newspaper obituary of #73625. Wiley H. Linkous. Susan E. Wagner-Linkes (74 kb) Newspaper obituary of Susan Elmina "Susie" Wagner-Linkes, wife of #7711. Center Copeland Linkes. Earl Linkes (107 kb) Newspaper obituary of #77116. Earl Hunter Linkes. Joyce Dean Wallace-Linkes (89 kb) Newspaper obituary of Joyce Dean Wallace-Linkes, wife of #77116. Earl Hunter Linkes. Edd Linkes (76 kb) Newspaper obituary of #77112. Ira Edmond Linkes. Althene Randall-Linkes (80 kb) Newspaper obituary of Althene Randall-Linkes, wife of #77113. Jacob McDonnley "Don" Linkes. Charles S. Linkes (112 kb) Newspaper obituary of #771161. Charles S. Linkes. Spencer Linkes (85 kb) Newspaper obituary of #77117. Ivan Spencer Linkes. To the Linkous/Linkes Family History Homepage.